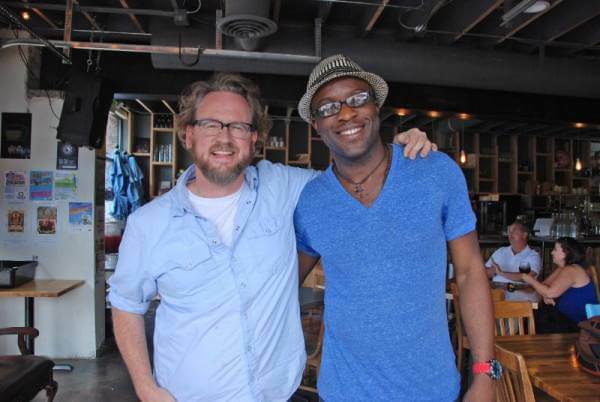 THE SCOOP: From your first cup of joe in the morning to your last dessert wine at night, business partners Yemi Mobolade and Russ Ware have you covered. They provide a hangout that is more of a community gathering space or meeting house than it is cafe, restaurant or even coffee shop. Hence the name Wild Goose Meeting House. Insisting on defining their enterprise in an unconventional way – rather than as a predictable “coffee and wine bar” – gives you a taste of their playful originality and thoughtful attention to every detail. “We both love people,” explains Yemi, above right. “At the end of the day, the product we’re selling is ourselves.” They’ve gotten used to hearing the comment: you guys are nice. “We try to put people at ease,” he grins. Russ describes the feel as “coffee shop vibe meets upscale wine bar,” with fresh by-the-cup coffee and traditional style espresso, Colorado craft beers, unusual wines, and house-made ginger beer and chai tea. Sandwiches are composed with high quality deli meats from Ranch Foods Direct. Roll-back garage doors on two sides allow seating to spill out onto the sidewalks along Tejon and Boulder streets. The shelf-laden interior walls, perfect for old books, coffee cups and more, are another welcoming touch.